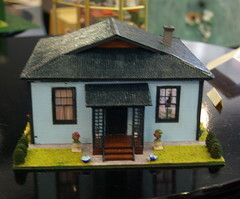 This is my response to Marilyn’s Serendipity Photo Story for this week which I have also posted on my doll blog. 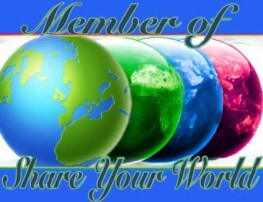 This post is in response to Marilyn’s “Serendipity Photo Prompt” for this week. Marilyn shared a photo of her childhood Toni doll who has a lovely face. 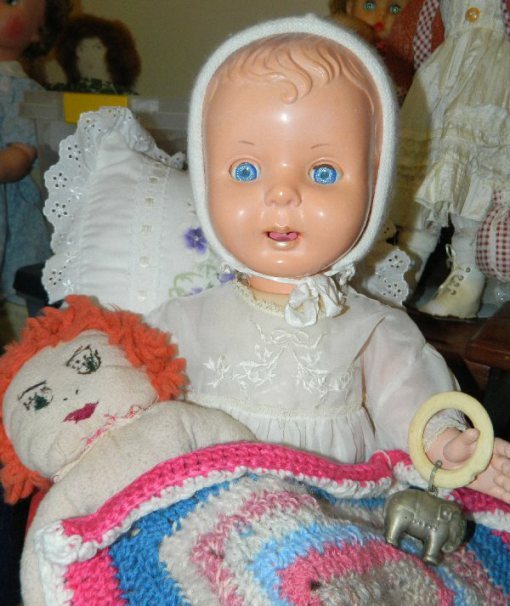 I still have some of my childhood dolls too although they are not in great condition. Theresa with her Raggedy Ann doll made by my mum. My mother loved dolls and I think that when she had little girls she was delighted not only to have two real life dolls to dress in matching outfits but also to have an excuse to buy dolls again. We probably disappointed her a lot by not providing her with grandchildren to buy them for too. It’s that time of year again. Christmas is on the way. Well actually most stores have had their Christmas merchandise out since well before Halloween but I refuse to acknowledge it until November. 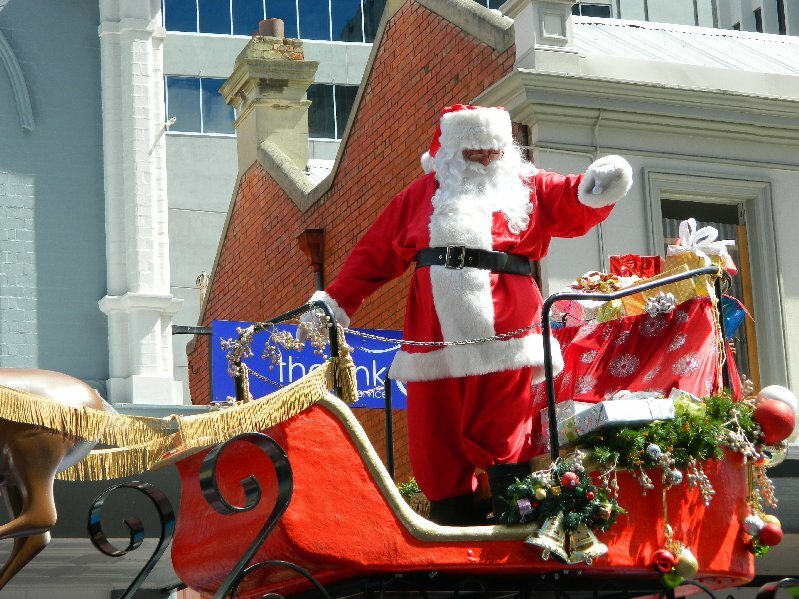 When I lived in Adelaide I considered John Martin’s Christmas Pageant the beginning of the Christmas season. 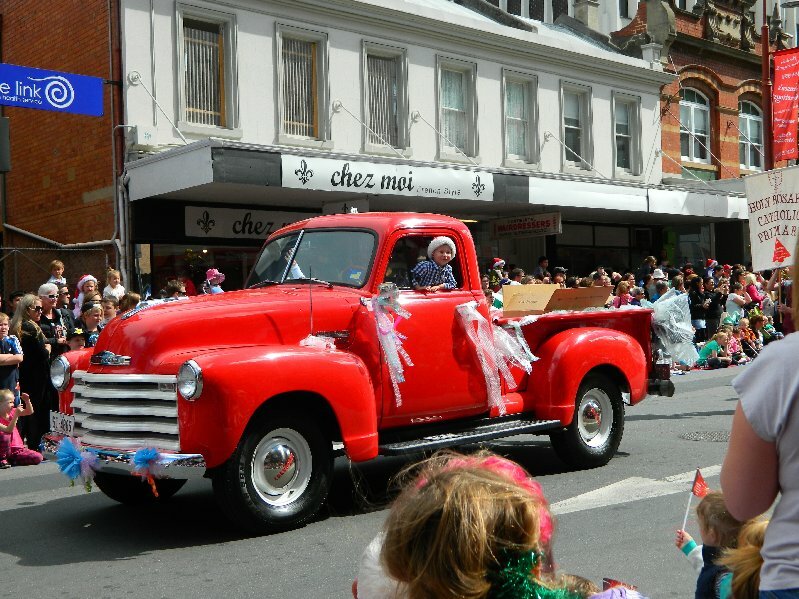 John Martins is long gone and it’s been more than twelve years since we left Adelaide but Hobart has a Christmas parade too and it was held yesterday. 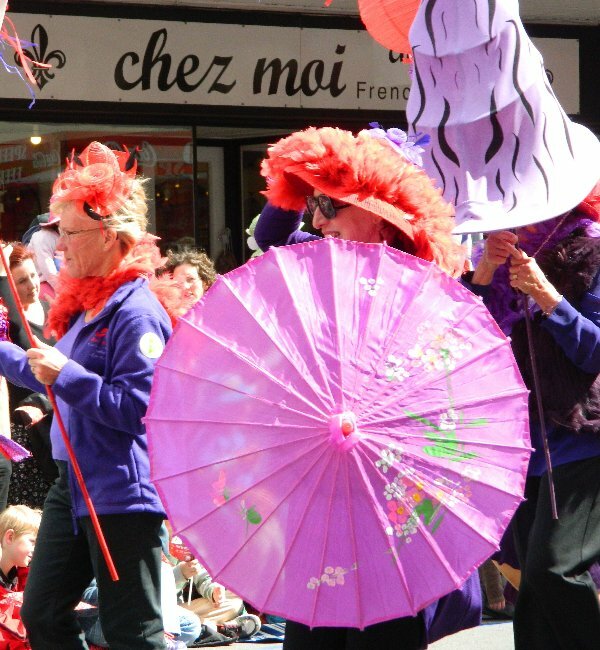 Although the parade is partly sponsored by a large department store the participants come from everywhere, businesses, schools, clubs and churches; it seems that anyone can enter a float. 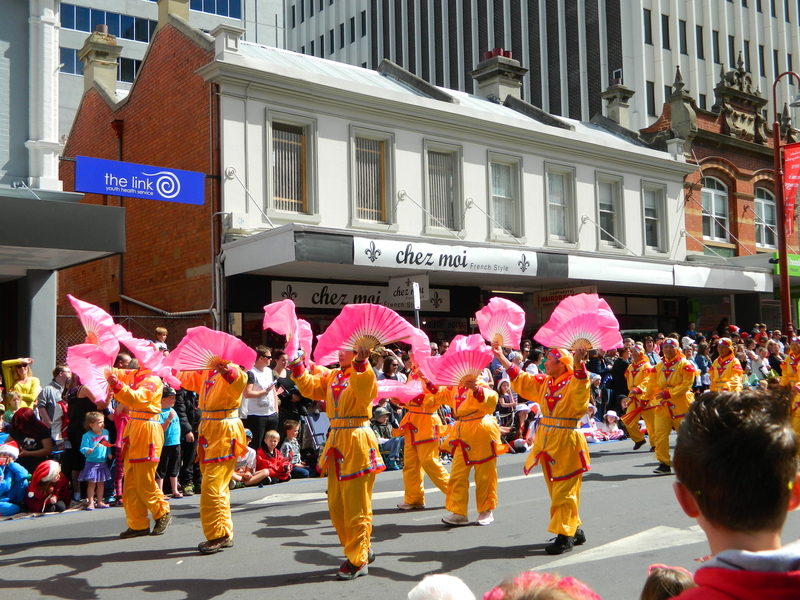 This years parade had a strong multicultural feel to it. 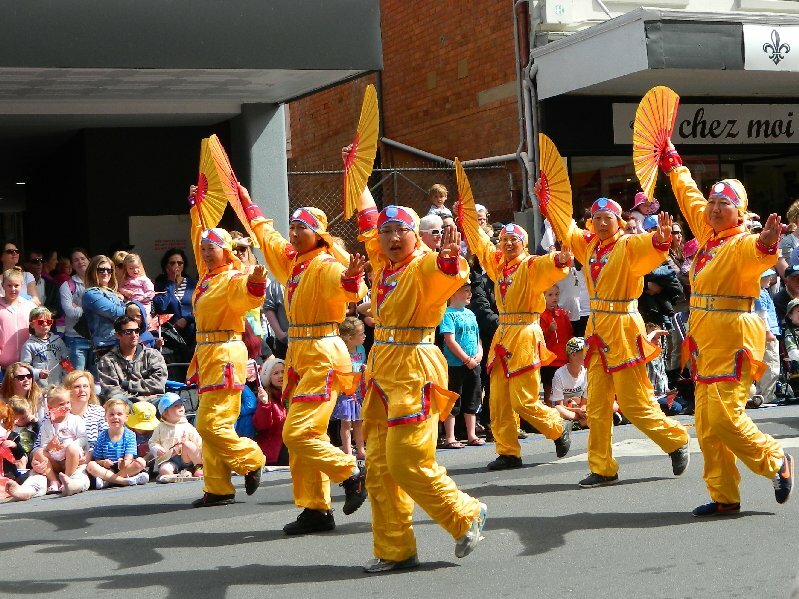 The best entry in my opinion came from the local Buddhist temple who had a Lion Dance, and many marchers with twirling fans. I think it is rather nice that they participate so joyfully in the Christmas celebrations. 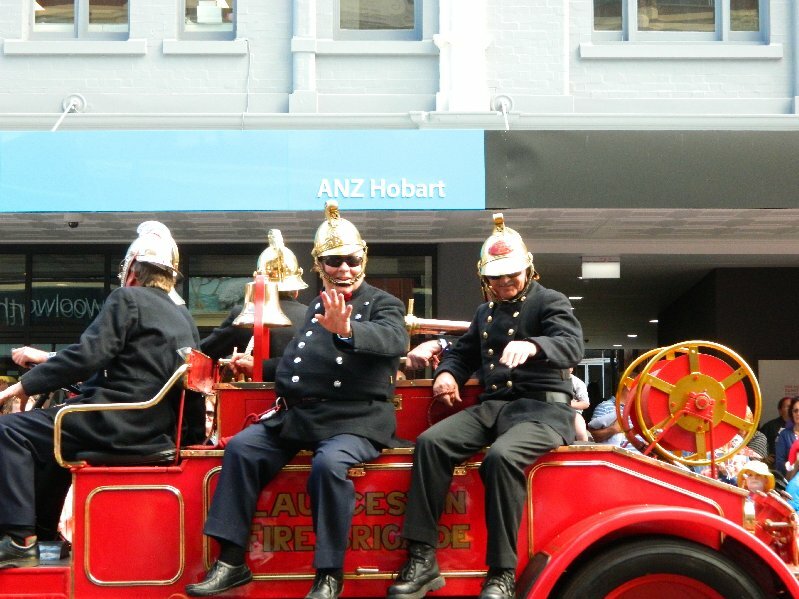 I did not have an easy time taking photos this year as my bus only arrived in Hobart ten minutes before the parade was due to start. My friends and I didn’t have as long to choose a good spot to watch and I had the problem of a couple of people standing nearby who kept moving and spoiled some of my pictures. 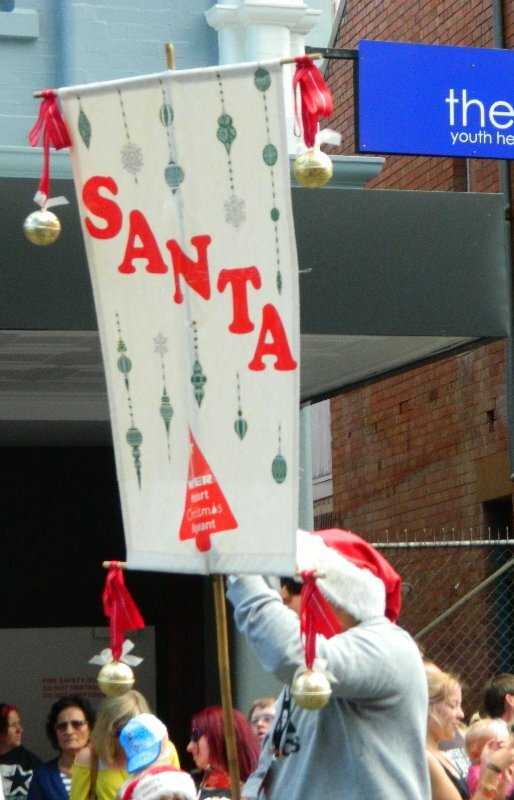 However I did get a few that I liked and it was a nice sunny day for a Christmas parade. Some of my favourite displays this year were the RSPCA and the Sled Dogs for the obvious reason that they had dogs, very excited dogs I might add. We were near the beginning of the route and the dogs after waiting around to start were excited to be going on a big public walk. My friend Ally’s old primary school had done a very clever display of “The 12 Days of Christmas with all the swans a swimming, maids a milking etc. It was one that I was unable to photograph unfortunately. 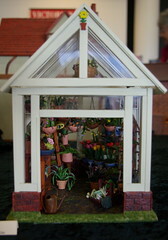 I also liked one from Glenview, a Hobart retirement home. 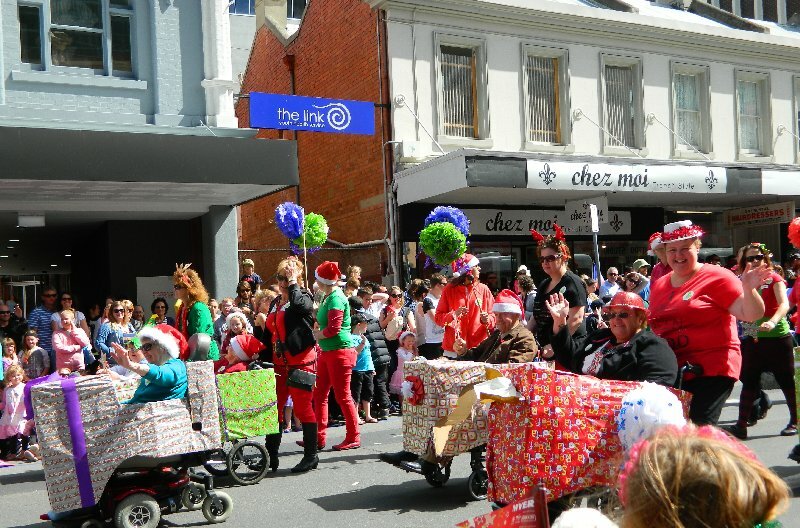 They had put some of their residents in the parade with their mobility scooters and wheelchairs decorated as Christmas parcels. The Red Hat Ladies looked great although I didn’t get a good shot of them. 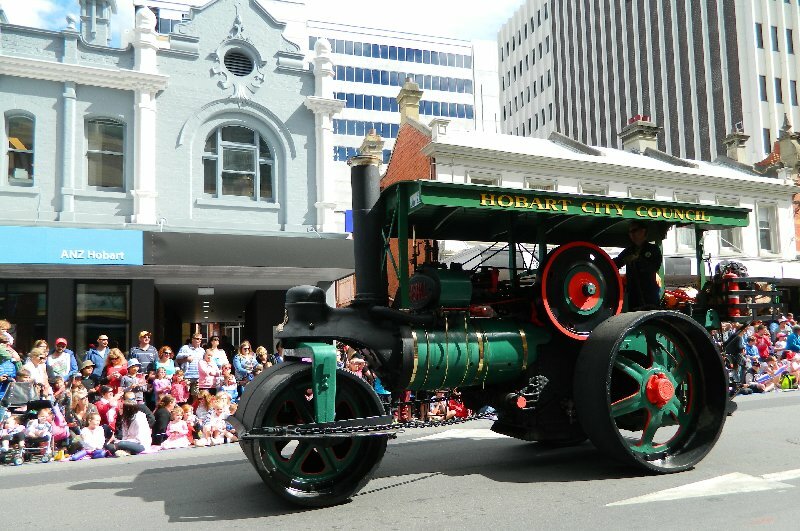 The clown doctors were there again, and some nice old vehicles, my favourite steam tractor, a vintage ute and a fire engine. 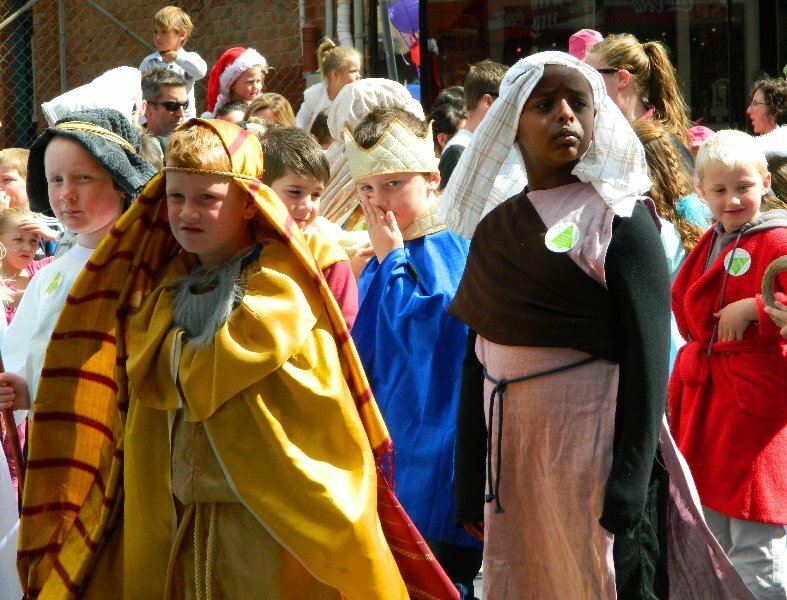 Some of the churches had more traditional Christmas themes. This was part of a recycling display. I love the little kid leaning out. 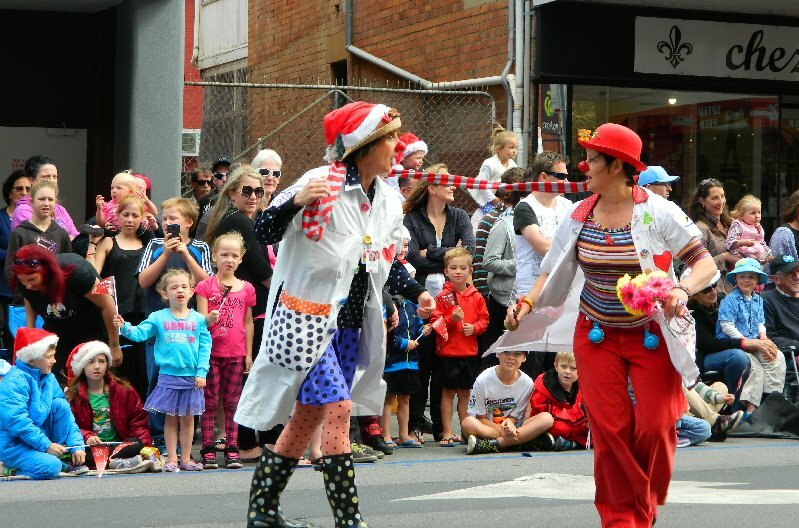 Two of Hobart’s Clown Doctors who cheer up sick kids. My favourite. I love these things. 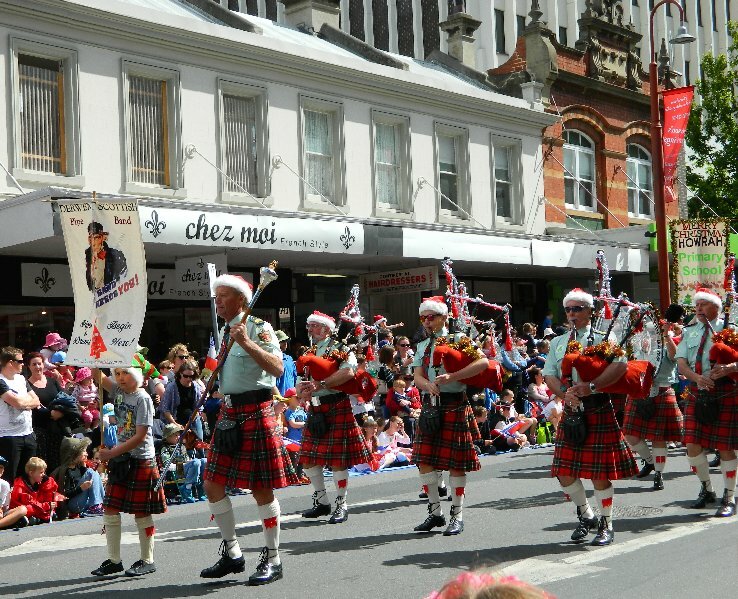 There was lots of music too with all the usual suspects, the Police Pipe Band, the Hobart City Band, an army band. 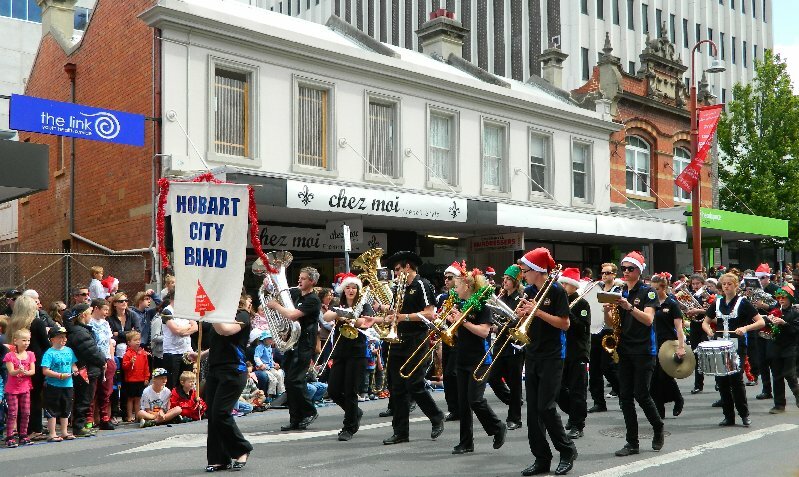 You can’t have a Christmas parade without bands. Finally Santa Claus arrived on his float in his traditional red garb. 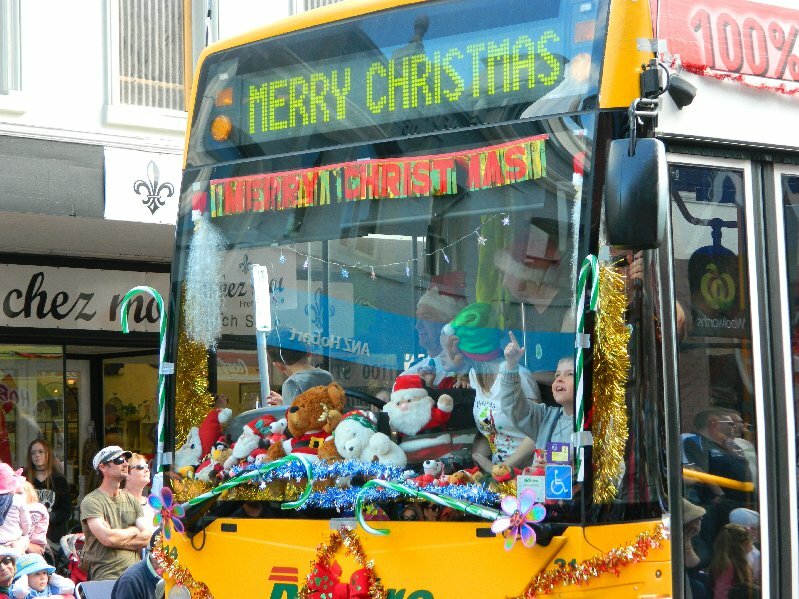 Christmas had officially arrived in Hobart. That’s a good question. I don’t particularly care for either but why? I suppose that I don’t like to see myself the way others see me but then everyone sees things differently don’t they? What I perceive about myself and what other people perceive may be quite different. When I was a small child we had family spread around the world, one aunt and her family in South Africa and another aunt and her family in Australia while the rest of us were still in England. I think it was mum’s brother who started the idea of sending audio tapes to them. When the family was gathered together he would bring out his great big reel to reel tape recorder and microphone and all the adults would record a message for them. Then it would be the turn of the children; my cousins, my sister and me. My cousins had no problem with this and my sister who was very young could usually be coaxed to say a few words. Not much was expected of her because she was little but I just freaked out at the idea of doing it. As I’ve often mentioned I never liked drawing attention to myself and family situations were no different. I didn’t see mum’s family very often as we lived in different towns. I hardly ever saw my uncle and never really knew what to say to him. I had never even met the relations who were overseas. Having to speak out loud in front of everyone was my idea of torture. I felt very pressured with all the adults trying to convince me that it was easy and that my aunties would be disappointed if they did not hear my voice. It took me years to get over that phobia about tape recorders. As a teenager I bought a cassette tape recorder and made myself speak into it and that helped.When mum and I made audio tapes to send people we always did it as if we were just having a conversation with each other. It felt more comfortable that way and I had no problem with making them. Do I hate the sound of my own voice? Not really but I do think it’s probably too loud and I know that I speak too fast sometimes. I haven’t, thank God, had to watch a video of myself recently. Watching our wedding video is embarrassing enough and the family home movies from my childhood are even worse! I don’t really enjoy seeing photos of myself either. I like the ones taken when I was a little girl, well most of them, but pictures of me from about 9 years old onwards remind me of how awkward and uncomfortable I felt during those years. I do have a few that I like that were taken when I was in my twenties, thirties and forties. Pictures of me now remind me that I’m grey haired and over weight. However I do like to have one taken now and again when I know I look nice or at least when I am smiling. I suppose I want my existence to be acknowledged after I am gone. Wedding day, I was 20, David 22. I have some really bizarre dreams at times, I know they are weird even while I’m having them but like many people by the time I am properly awake the dream is gone and I don’t remember what it was about. I suspect most of them are more about what I read or saw on TV that day than anything to do with me. However, when I was younger I used to have a recurring dream that I was at school. I don’t remember specifically what each dream was about but they used to upset me a lot. I sometimes used to wake up in tears. I didn’t always enjoy school. I didn’t enjoy doing subjects I was bad at, like sewing, cooking and any kind of sports. 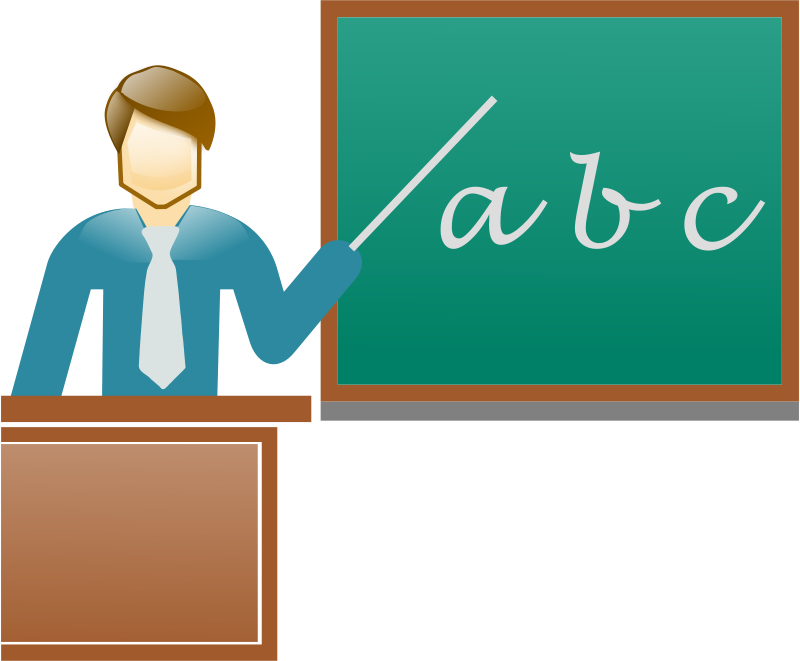 I didn’t like teachers who shouted or were rude and sarcastic. As I’ve mentioned in the past I was a shy child and hated to draw attention to myself so I hated doing anything that involved speaking up in class, I was nervous around teachers and didn’t really want to play with the other kids even when well-meaning teachers tried to insert me into a group. It wasn’t all bad though, I liked some teachers who introduced me to ideas that I would never have picked up at home. I wasn’t bullied; I got on well with my classmates but I was glad when school was finally over. After I left school I had the school dream through my late teens and early twenties and the theme was always that I was back in school again and I’d be trying to tell them I didn’t belong there. Later, as I moved into my thirties, I had the dreams less often and they changed. 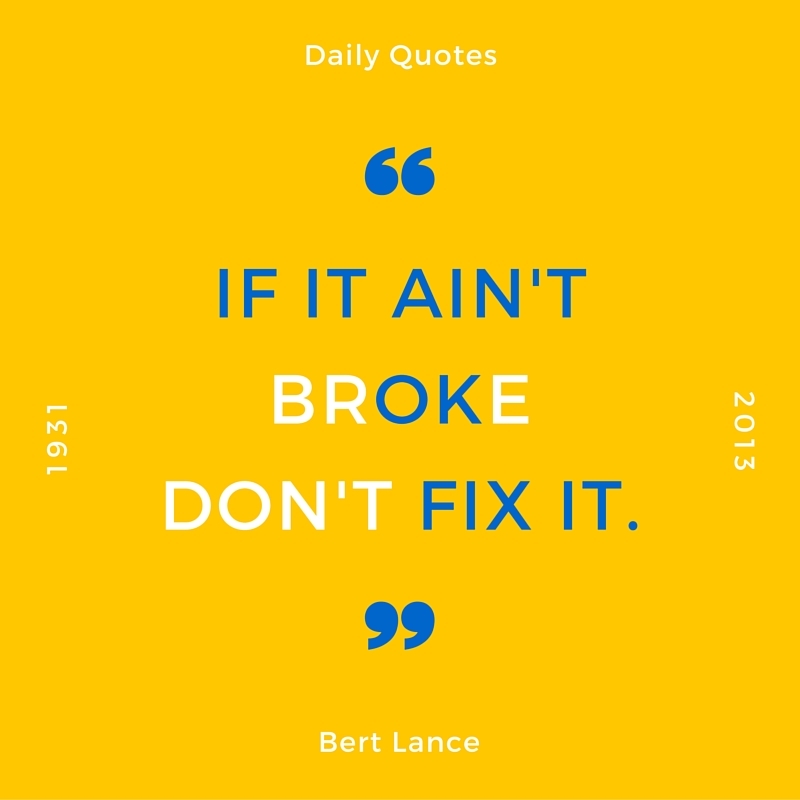 Now I was saying. “I don’t have to be here.” and I would leave. In the dream that felt good. The dreams became less frequent over the years until they almost disappeared completely. These days I rarely dream about school, or if I do I don’t remember so it must be less upsetting. I think I have dreamed myself in school occasionally but I’ve not been upset about it and haven’t tried to escape. What does it all mean? Well my interpretation is that as I’ve grown older and more confident I haven’t felt that I had to prove myself to others or conform if I didn’t want to. I’m happy with who I am and I’m more accepting of things I can’t change. I’ve read a bit about the meanings of dreams and what it says about dreaming about school seems to tie in with my feelings. I don’t know what Freud would have said but I bet he’d have had a field day with my “soap opera” dreams if I could ever remember them! Mum C1922 with one of her grandmothers. 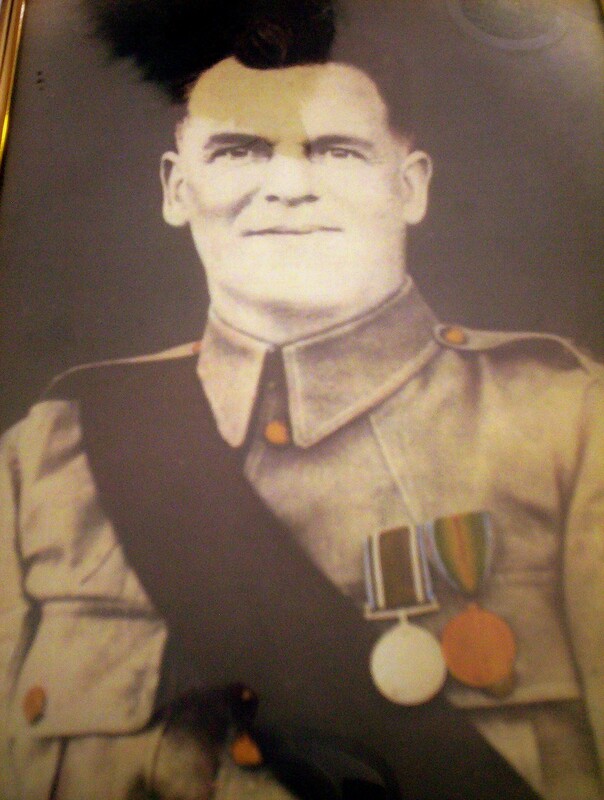 My grandfather was in the British army for many years and in the 1920s early 1930s he was posted overseas. My grandmother and their five children travelled with him, first to Malta, then Egypt and finally to India returning to England around 1934. My mother often used to tell me about those years which she obviously thoroughly enjoyed. How I wish that I could remember more of it now that she’s gone. Here are a few stories that I do remember. Mum was born on Christmas Day 1921 in Hounslow where my grandparents lived in the barracks Married Quarters. She used to enjoy telling the story of how her mother was in the middle of preparing the goose for Christmas dinner when she went into labour. I never found out if the family sat down to the meal without her or who finished cooking it. Naturally the baby was named Carol. 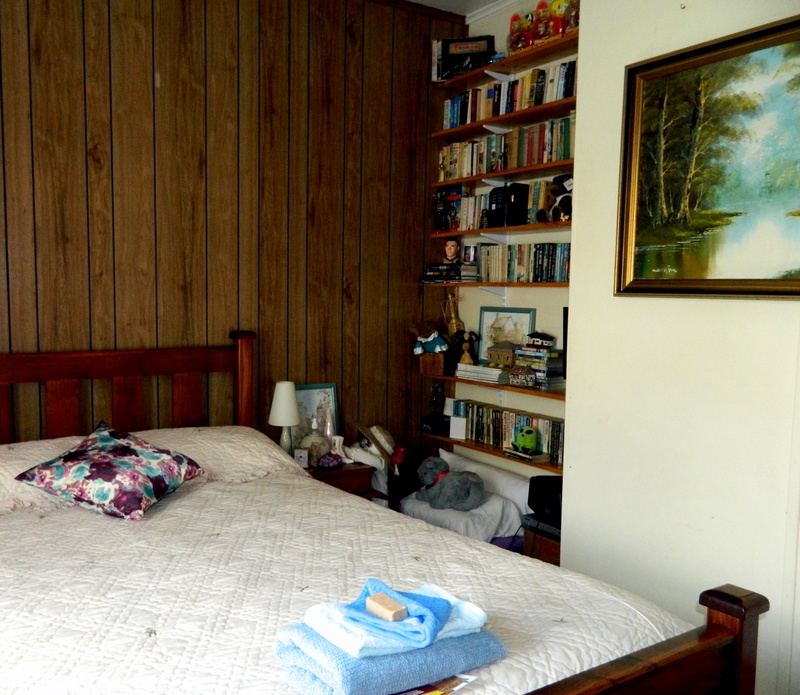 Mum was the youngest of the five; her eldest sister Marjorie was born in 1914 and brother Dennis in 1915. 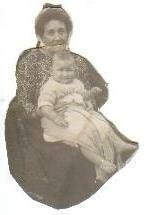 Grandfather went off to War and after he came back from France twins Daphne and Gladys were born in December 1919. The story goes that when the babies were born Gladys, the smaller of the two babies was abandoned by the midwife who did not expect her to live. My grandfather took over her care and fed her using a fountain pen as a bottle. She survived and thrived but was always much shorter than her sister which gained her the nickname of Tiny. 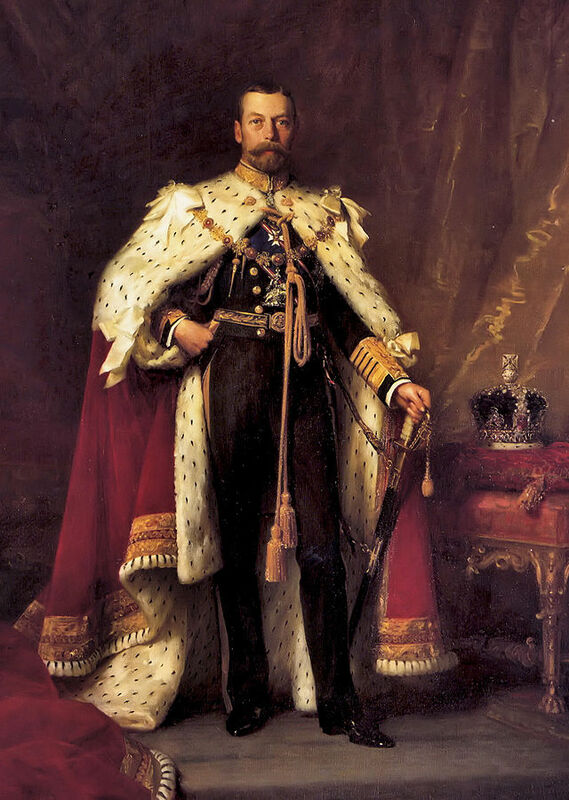 King George V. Wikimedia, Public Domain. Mum shared another memory of her early years. A visit to Gibraltar when the family was en route to Malta where she saw the famous apes that live there. They are called Barbary Macaques (Macaca Sylvanus) and at that time there was a saying that if the Apes left Gibraltar so would the British. As a four year old all my mum knew was that she wanted a monkey of her own and monkeys remained her favourite animal for her entire life. I still have a collection of china monkeys that belonged to her as she was often given them as gifts. 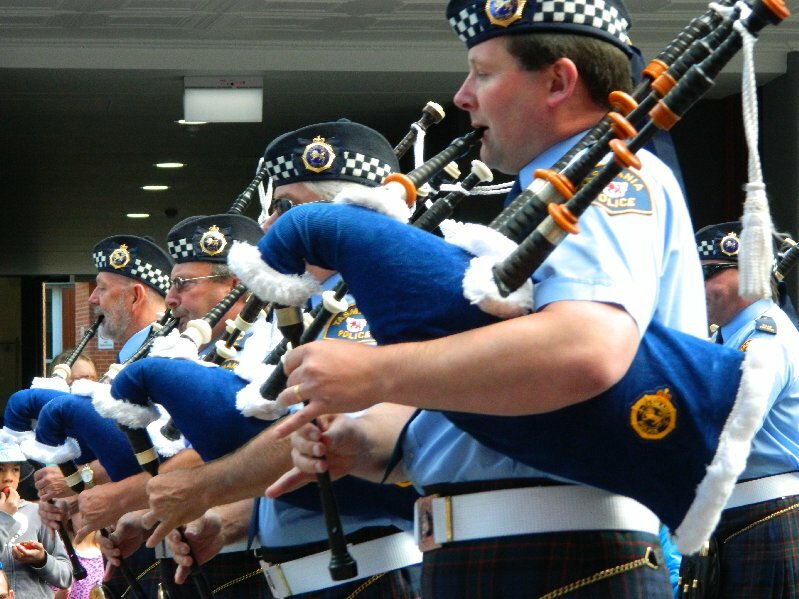 You can read more about Gibraltar and its famous inhabitants here. Photo description below. Here is a link to the photographer’s Wikimedia page. 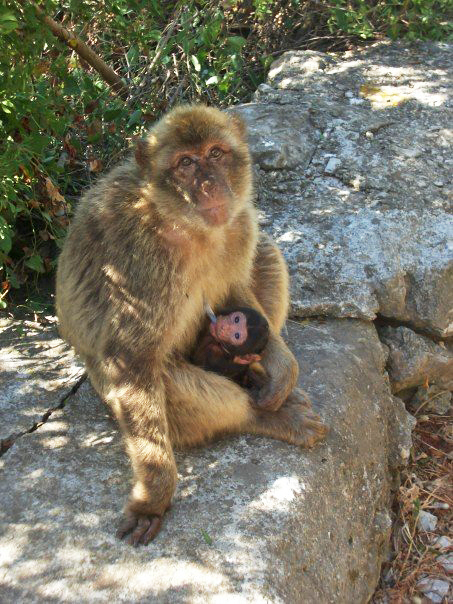 English: Female barbary macaque with young suckling at Mediterranean Steps, en:Gibraltar. (Reusing this file) CC-BY-SA-3.0,2.5,2.0,1.0; Released under the GNU Free Documentation License.